Billingham International Folklore Festival is a festival of Dance, Music, Song, Arts & Crafts, featuring the Traditional Dance & Music Ensembles from all over the world. The 50th BIFF runs from Friday 8th to Saturday 16th August 2014, and offers nine days of displays & concerts, all in colourful national costumes. 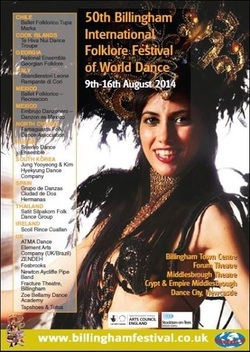 The acts confirmed include Ballet Folklorico Tupa Marka, Te Hiva Nui, National Ensemble of Georgian Folklore, Sbandieratori Leone Rampante di Cori, Ballet Folklorico Embrujo Danzonero, Famagusta Municipality, Siverko, Jung Yooyeong & Kim Hyekyung, Grupo de Danzas Cuidad de Dos Hermanas, Satit Silpakorn, Scoil Rince Cuallan, ATMA Dance, Element Arts Company, Zendeh, Fosbrooks, Newton Aycliffe Pipe Band, Fracture Theatre, Zoe Ballamy Dance Academy, and Tapshoes & Tutus. Ticket prices vary depending upon event. Venues Various venues in Billingham, Middlesbrough & Stockton on Tees. Get involved Participation activities include dance courses, workshops, children's club etc.